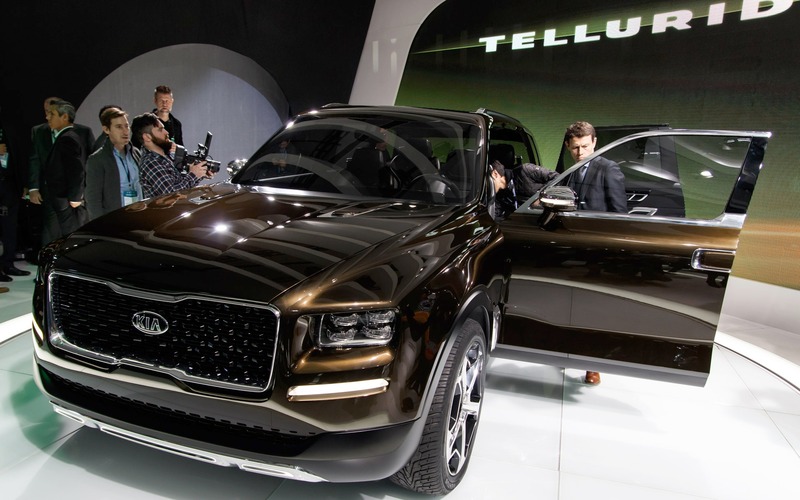 Kia just launched a new concept at the Detroit Auto Show; named Telluride, the vehicle is heralded as the future of the brand. Plus, it may indicate the brand is thinking about going back in the full-size SUV segment. Built on the Sorento’s platform, the Telluride is longer, larger and higher. This gives more room to all passengers, notably those sitting in the third row. Also: 2016 Kia Sorento Unveiled in L.A. The rear doors are rear-hinged, which provides better access for everyone. There are captain’s chairs in the two front rows, and those in the back can recline. Since this is a concept, it features a lot of novel technology: in each seat, a metallic plate filled with sensors has been fitted. Said sensors communicate with a computer that analyze the occupant’s health and offer some light therapy for those who may need it. The Kia Telluride Concept is a hybrid: its conventional V6 develops 270 horsepower, and an electric engine adds 130 more for a grand total of 400. Los Angeles 2016 Kia Sorento Unveiled in L.A.